We hear it everyday from small business owners, "I need to increase my revenue!". While this may be true, we find there are different and deeper meanings to this phrase. Usually what is desired is more income and profit. The majority of the time just increasing revenue is short sighted and may even be even detrimental. There are so many questions around what it will take to support increased revenue. Does the infrastructure exists to support the new sales? What are the acquisition costs required for the additional revenue? What is the margin for the additional sales of products or services you are offering? The first two questions are easily addressed by understanding your operations capacity and your marketing/ sales systems. Generally these are straightforward answers that can be calculated and determined with the right team. We will address these in subsequent posts. What we want to focus on in this post is the third question and the all important margin. Would you rather earn a net margin of 5% off $1,000,000 in revenue or 10% off $500,000 in revenue within your business? No, this is not a trick question. Yes, they both equal $50,000, however the second is much better. Why? - read on. So let me ask you, what is the gross margin and/ or net margin of your top three products or services? If you cannot answer this question with no hesitation, you have work to do. 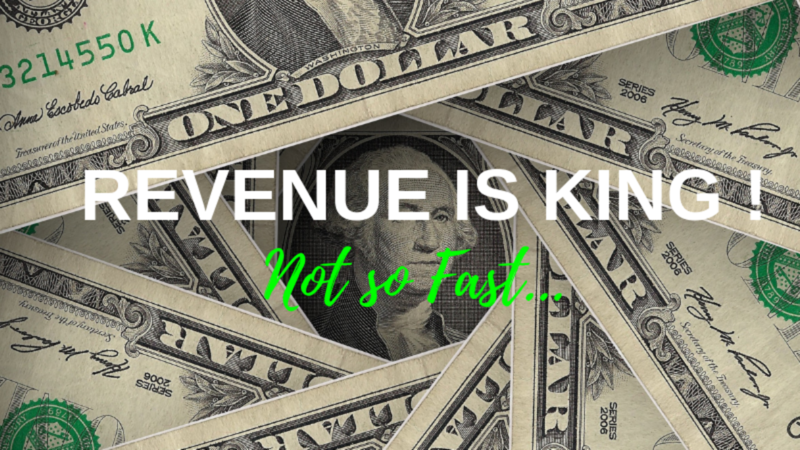 You must know this and understand the importance of knowing this to fully grasp the affect increasing your revenue will have on your business. Your expectations need to be clear. First, lets discuss margin. There are more than one type of margin. We will discuss the two basic types, gross margin and net margin. The classic definition of gross margin is the difference between what it cost to produce a product or service (COGS or cost of goods sold) and the sales price (revenue) of that product or service. If the gross margin is not positive, then it needs to be addressed swiftly. Net margin is the gross margin minus all selling, general and administrative expenses (S,G&A). S,G&A are the non-production costs of the product or service. Hopefully in all cases for your business the gross margin and net margin is positive. If not, watch out. Why is it important for gross margin of the business to be positive? If gross margin isn't positive, then the business will not survive for long without cash infusions. Simply put, the business must be subsidized until the gross margin is increased to above the break even point, and even then there is more work to do. Break even is where the total costs of the business equates to the total revenues of the business. A gross margin percent of products and services can be calculated so you know where they equate to break even. Even if the gross margin is positive, yet the net margin of the business isn't positive, then your business isn't covering the fully loaded costs that it takes to run the business. In other words, the business isn't profitable because it is not covering the S,G&A costs of the business. Eventually the business will be in the same situation of needing to be subsidized or cost cutting such as layoffs or asset sales will need to occur. In the end gross margin and net margin for a business must both be positive. At the product or service level, if gross margin is negative, then the costs to produce that product or service aren't being covered, much less any non-productive costs. The business may still be profitable, but the business is subsidizing that specific product or service by eroding profitability from the overall business. In other words, other profitable products or services are keeping the company afloat, while the ones with negative gross margins are a drain on the overall profitability. While a positive gross margin means that the cost to produce that product or service is being exceeded by the sales price, a negative net margin may still exist. Having a negative net margin means that the fully loaded costs are not being covered by that product or service. In other words, the business may still be profitable, but the non-productive costs are not being attributed to this product or service. Many times you will hear the term 'contribution' or 'contribution margin'. They are not contributing to the S,G&A costs. 1. You must know what gross margin percentage equates to break even for your business. For example, if break even is 30% gross margin, then your goal is to have only products or services that are higher than 30% gross margin. 2. You need to know what the gross margin and net margin are for each of your products and services. Gross margin is fairly straightforward to calculate. We already explained that is is total revenue minus total costs. To get the percentage you would divide that by total revenue. For net margin, it may not be as simple to do by product or service. Many times the S,G&A are not broken out by specific product or service. In that case the net margin is calculated by subtracting the S,G&A percentage of the business from the gross margin of the product. For example, a product with a 30% gross margin minus a 20% S,G&A would equate to a 10% net margin. 3. If the gross margin for a product or service is negative, you need to take immediate action. Either you need to raise prices, lower costs or stop offering that product or service. Depending on your business, raising prices may be the quickest solution. Either way it is under priced for the costs associated with it. This is what we call a 'loser'. Producing more of these just puts you in the hole deeper and faster. 4. If the net margin of a product or service is negative, the answer is not as straightforward. It may mean that you need to continue as you are, knowing that other products with higher gross margins are covering your overhead expenses (S,G&A). It may also mean that you do want to investigate this product further. For example, a product with a 19% gross margin and an S,G&A of 20% means the net margin of that product is -1%. However, you may know that the resources that make up the S,G&A costs are barely utilized by this product. In that case continuing with this product may make complete sense. So let's go back to the question above about the $50,000 result of a $1,000,000 revenue stream or $500,000 revenue stream. Is the answer obvious now? What if each business was doubled? The $1,000,000 revenue business is now a $2,000,000 business and the $500,000 business is now a $1,000,000 business. Each are still bringing in $100,000 now. But look at the $1,000,000 business at 5% along side the $1,000,000 business at 10%. Which one of those would you want - clear isn't it? You want the higher margin. Even though the $2,000,000 business creates the same $100,000 in profit, the effort, infrastructure and time to run it versus a more highly profitable $1,000,000 business are completely different. The larger revenue takes more energy, consumes more resources and produces less of a return on investment. This is why knowing your margins are critical to having a lifestyle of freedom as a business owner. Join us out at www.BusinessOwnerFreedom.com or our new podcast on iTunes under the same name, Business Owner Freedom.